“In 1972, a crack commando unit was sent to prison by a military court for a crime they didn’t commit. These men promptly escaped from a maximum security stockade to the Los Angeles underground. Today, still wanted by the government, they survive as soldiers of fortune. If you have a problem, if no one else can help, and if you can find them, maybe you can hire… The A-Team.” [Insert theme: dah dah-dah-dah, dah-dah dah]. There is no more memorable opening to a show or more easily-recalled theme than that of the 80’s TV hit, The A-Team. This was in fact one of The Movie Mind’s favorite all-time shows of my youth. Needless to say, I was highly anticipating the release and had some very lofty expectations. My advice to you true fans of the original series is to be patient. I was nitpicking the entire opening 20 minutes about what a butchering they did to the story and characters, but was pleasantly surprised to find out they were merely providing some back-story to the opening dialogue about the “crime they didn’t commit”. While they went a bit longer on that segment than needed, it did provide a backdrop to all the young viewers who probably never even heard of Mr. T.
Without even seeing the film, I thought the casting was brilliant aside from one big blunder: Liam Neeson as Hannibal Smith. He lacks the charm, charisma, and comedic nature of the Alpha-Team’s original leader. Every time he spoke, it sounded like life or death, ala his notable line from Taken: “I don’t know who you are…what I do have are a very particular set of skills…Skills that make me a nightmare for people like you. If you let my daughter go now…I will not look for you…But if you don’t, I will look for you, I will find you, and I will kill you.” While he had a flare for the dramatic, the original Hannibal was much more lighthearted and funny. Other than that, I must say the cast was put together brilliantly. The true stars in my opinion were Sharlto Copley as the insane Capt. Murdock, and Bradley Cooper as the lovable ladies-man known as Faceman. I couldn’t help but think what a meteoric rise Cooper has taken from a classic scene-stealer role in Wedding Crashers through his dominant performance in The Hangover and onto another starring lead in this remake of an all-time classic series. As I previously mentioned, the beginning of the film is told by building the history of how this crew met and became one. While I don’t think this was needed, it was still entertaining. The film progresses to develop the underlying storyline of how this unit was framed for the crime they didn’t commit. It did hold true to the original series in that there was a high-ranking officer who is the only one that approved their mission but is no longer “available” to clear their name. There are some nice homage’s to the original series all around and I do think it held true especially with the cartoonish violence that always had the bad guys walk away relatively unscathed. 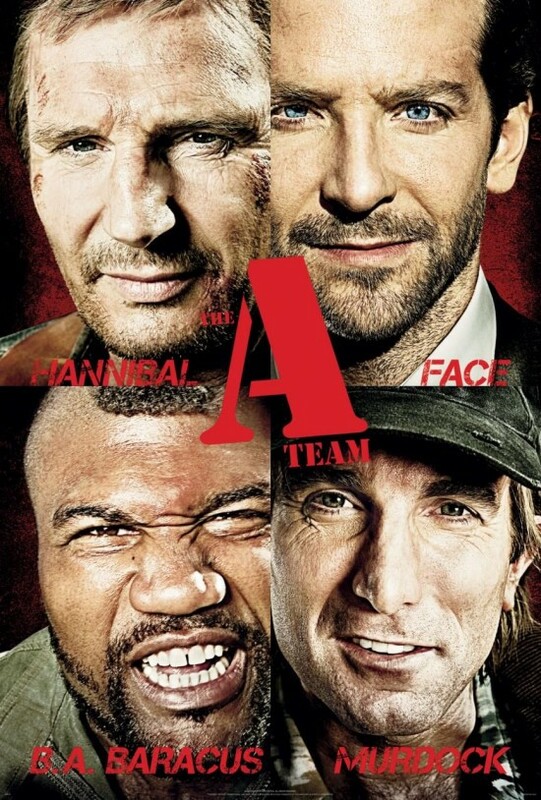 There were Hannibal’s crazy plans, Murdock’s insanity (and hilarity), Face’s charm, and BA’s fear of flying. I do wish the notorious van would have seen more screen-time, but overall I was happy with the modernization without losing the “essence” of the original show. While the film was far from perfect, so was the show, and still I was able to enjoy it all. I feel like the best things about the show were held true, and where they improvised and modernized were in spots it seemed ok to do so. One thing I wish was avoided was the relation to modern-day warfare. While the show was tied into the Vietnam War, it could have managed just as well without the real-life warlords and locales that lately seem to be the defacto setting for any film remotely related to conflict. Overall I was pleased and entertained. I think those fans of the original show will be very happy with the very detailed and accurate tributes, while those newbies should enjoy the action-packed and suspenseful two hours. Interesting Cameo Appearance: Gerald McRaney (former star of hit early 90’s television show…wait for it…Major Dad. Couldn’t have picked a better blast from the past than him and a stark reminder to just how much Vikings’ coach Brad Childress really looks like him) as General Morrison, a longtime friend to Hannibal and commander in charge of their unit. Col. John ‘Hannibal’ Smith: I believe no matter how random something may appear, there’s still a plan. Sgt. Bosco ‘B.A.’ Baracus: You pancaked my van! I’m gonna kill you, fool! Capt. ‘Howling Mad’ Murdock: You can’t park there, that’s a handicap zone. Capt. Charisa Sosa: They are the best and they specialise in the ridiculous! Col. John ‘Hannibal’ Smith: Give me a minute, I’m good. Give me an hour, we’re great. Give me six months and I’m unbeatable. Lt. Templeton ‘Faceman’ Peck: This is beyond nuts, boss. Capt. ‘Howling Mad’ Murdock: Now we’re talkin’. Lt. Templeton ‘Faceman’ Peck: What the Hell was that? Capt. ‘Howling Mad’ Murdock: If you look out the right hand side of the aircraft you will notice that the right wing is on fire. Col. John ‘Hannibal’ Smith: I love it when a plan comes together.